Blog Quick Quotes: Who wants to win a canvas kit? Who wants to win a canvas kit? Continuation of $3,000 in prizes in 30 days!!! Do you love Quick Quotes 'all inclusive' canvas kits? Leave us a comment --- Tell us: what do you love about Quick Quotes 'all inclusive' canvas kits? OR What do you typically do with your canvas projects after they're created? Never tried one... what excites you about working with canvas? Check back tomorrow (7/27) when a winner will be selected and they will have their choice of one of the three canvas kits seen above. I love canvas kits! I love using them to features pictures of my kids! Plus there are always fun new techniques! I have never done a canvas kit but would love to try. It would make the perfect wall hanging in the family room. I have never used a canvas kit. They look new and creative would love to give it a try. I have never used a canvas kit and would love to try it out! It looks like a great give away! Canvas kits are a form of crafting I haven't tried but certainly would like to. I love trying new things and from what I see I love the textures. what is not to love about the canvas kits. They are such a beautiful piece of artwork for your walls. I love putting them together and seeing the end result. Love that Quick Quotes products make the title work for projects so much easier. Love the new colored vellum!! Would love to create a canvas for my home! Thank you for the chance to win! I have never done a canvas kit. This would be a great opportunity do one. It would be great to hang in the living room. Ive never tried a canvas kit! I think it would be a fun way to jump in! I would love to hang one in my scrap room! I LOVE that your kits come with everything you need to compltete them as pictured, and that you always include one of your powderpuff chalks with them too. I love those chalks! Admittedly I have gotten a few of your kits that I've altered to fit my own needs, and thats the other great thing about them. You include all the paper and everything but make it so easy to change the look while still keeping it all looking beautiful. There is no searching for just the right pieces or papers when using your kits. I love them!!!! I love the canvas kits. I first started using them a few years ago after taking a class at rhe Sacramento expo. Now my parents, in laws and I have beautiful canvas artwork diplayed in our homes. I love the variety of quotes you can use in a single kit. It does help to personalize each one. I plan on creating more and hoping you are having classes in Portland Oregon this fall at the expo. I had a chance to make one of these at a Scrap Expo. I'd love to try another! I have always wanted to try one of your beautiful canvas kits. 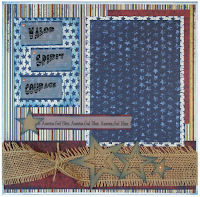 Have done many of your scrapbook kits and I love them. I've never used a canvas kit. It looks like it would be amazing...and I love your regular kits! Please let me try the canvas kit! Thanks so much! I also have never used a canvas kit, but I have used Quick Quotes kits before and they are creative and all-inclusive. You can follow their example or go your own way with the design. Either way, you have all you need for a great looking project. Also great for gifts. 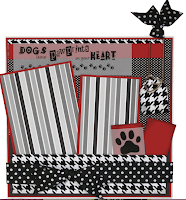 Canvas kits make great gifts! All you need is right there and you can always add more. I love giving them. Gifts to friends who would not make these themselves. I love QQ products but have never tried a canvas kit. I absolutely love the Valor, Spirit, Courage canvas. I would love to put my dad's service picture on that layout. It is the perfect remembrance for him. He earned the purple heart and was the most patriotic person I have ever known. Thank you QQ for capturing those emotions for me. To tell you the truth this is my first visit to your blog. I heard about you through Glue Arts. Trusting them so much I had to check out your company/products! I love working with canvas but have not tried a kit. Great idea so now I must try! I bought a canvas to make the card holder. I love the kits. I have never tried a canvas kit. I love the look. So glad that I found your kits. Will have to check them out! I haven't worked much with canvas, but I am going to the qq reserve (cannot wait) and hopefully will get more comfortable with it! I haven't worked with Canvas! I would really luv to get my hands on a kit and try it. I would probaly hang it in my family room or bedroom. I have never tried the canvas kit but have always wanted too. I love the page kits and think the canvas kit would be a lot of fun. I haven't tried the canvas kits, but would love to! Up to this point, the only thing I've used canvad for is oil painting. But I just bet it would be fun for scrapbooking too!! Canvas is relatively new to me. I did do one at an expo and would like to try more. Never done canvas, but would love to display one of my son. I honestly never tried a canvas kit but love the way it looks on walls and how it can display anything you make with it from pictures to children's art displays to just using it as decorative piece in your home. It adds an extra one of a kind piece to your decor. Love them all. I took the 12x12 Stretched Family Canvass class in Mesa and love it. If these are offered as classes next year, I'll take all 3. Or maybe I'll just have to save up and buy all 3. I love QQ canvas kits. They make wonderful presents for grandparents and great-grandparents. I have given them for Mother's Day and Christmas with pictures of their grandkids. I love the kits, though i have never used any. I would love to try one and use it as decor in my scrapbook room. Especially the Pawprints, as I have 6 cats to scrapbook. Love it. Thanks for the chance to win. Love these kits! I have never tried one of your kits, but I love working with canvas because you can do anything to it! Thanks for the chance to win! I'm already a follower. I have never worked on canvas and paper combination, but I love to make wall hangings with my embroidery machine and canvas. It seems like a perfect step up for me to go from embroidery to paper! *Hugs* and thanks for a chance to win an amazing kit!! Any of these would be a magnificent gift for friends or family members. I have not used a QQ Canvas Kit before, but I will be sure to check them out at the CK Convention this weekend! I have never used one of your kits, but I checked them out. They are so cool, it is nice that you get everything to make a beautiful piece of art that will be displayed and not in a book. I've never tried the canvas kits, but they are so beautiful. I would love to be able to display one of my "pages" like this instead of hiding it away in a book. I have also never seen or tried Canvas kits. I took a look at them on you site and they looked very interesting. Lots of different styles and things you can do with them. I love the canvas kits! My first experience with them was at a class I took from Quick Quotes at a CKC convention. It was "love at first site"! I love how artsy the end-product is. I now frequently use them as gifts! Thanks for the chance to win! These are simply gorgeous! I have never worked with a canvas kit before though I have worked with canvas textured paper and real canvas in mixed media projects. I love the added texture and dimension such materials give to projects that would otherwise require more embellishment to achieve the same effect. I also like that you can apply different media than you might use on paper alone... very versatile. I would love to try one of your kits. Wonderful kits! Love that everything you need is there! Would love to try one! I have never used of these type kits but they look great. I have never had the chance to use Quick Quote Canvas..... but sure looks beautiful and would love to try one! I love doing the canvas kits and being able to decorate my house with them. Taking scrapbooking to another level! I did my first canvas at a QQ class at my LSS. I love how I can be creative and have something to display in my home for everyone to see. I love the canvas kits I love mixing my pictures with my decor. I love them for gifts they are my favorite. I love qq and the kits each month. Cannot wait to see you in Dallas! I have never tried any Canvas kits or any project! I would love to, though! I love your Family kit would be great to feature our Family all getting together this week to celebrate my grandson's 2nd birthday! Thanks for the chance to win....also a New Follower!! I have never tried canvas but I would love to have some new wall art. I would really like to try that. Been wanting to try canvas. Did it only once at a QQ class! It was so fun. I just recently started working with canvas, but I have never done any of your kits. I love how beautiful the canvas pieces are as home decor items, and I really love the added texture they provide. Hi there, I did one of your canvas classes at our lss with my mom. We were both amazed by the sheer quantity of cardstock, embellishments, and the great ink pad that is included that just makes everything POP. I also appreciate the easy to follow instructions that come with each kit. I would like to thank you for giving my mom & me a hobby to bond together. I saw the canvas kits at the Mesa convention and thought they were amazing. I would love to be able to try one. Comment #68 is me. Couldnt use my google acct for whatever reason. Just opened an email inviting me to follow your new blog. YAY!!!!! so I really haven't had much time to view, but wanted to make sure I didn't miss the deadline. Looking forward to looking it over.